A stripped-down USA guitar that offers build and sound over visual ornamentation. Excellent, no frills build. #7 pickups sound great. Highly playable. US-made for half the price of the Core Line. Launched in 2013, PRS's S2 range sits between the high-end USA-made 'Core Line' guitars and the lower-priced, Korean-made SE range. And although the S2 models do use some Korean-made parts - primarily tuners, pickups and vibratos - the guitars are 100 per cent made in Maryland at the PRS factory. "The difference between the Core Line and S2 guitars lies with a redesigned production path"
The difference between the Core Line and S2 guitars lies with a redesigned production path: necks are three-piece, not one piece; bodies swap a complex top-carve for a more simple flat top with 'asymmetrical bevelled edge'. Maple tops, where used, are still figured, but not in the same league as the Core Line, and the finish process is different and faster to achieve. The S2s are still very much USA-made PRS guitars, just less expensive. The Core Line SC 245 won't leave you with much change from £3,000, even on the street; knock 50 per cent off, and you have the price of the S2 Singlecut. 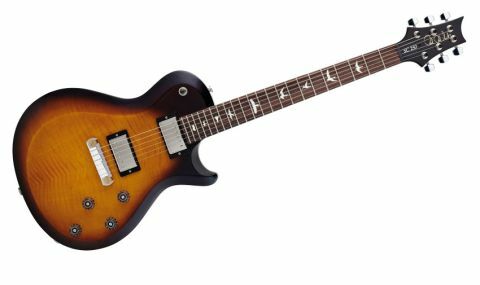 The original PRS Singlecut - which caused much legal wrangling with Gibson, soon after it was introduced in 2000 - has always been popular with artists, but for all that, has proved to be less so with the higher-ticket PRS purchaser. The Core Line has just one Singlecut, the SC 245, plus of course the long-running Tremonti. Conversely, the SE line has eight models, not including Zach Myers' new semi-hollow Singlecut. Like the existing S2 Custom 24 and the new-for-2014 S2 Custom 22, the S2 Singlecut has the same original 635mm (25-inch) scale, Pattern Regular neck profile and ivoroid bird inlays as standard - there are no options. Both the Custom 22 and Singlecut use new Korean-made versions of PRS's #7 humbuckers - which were originally fitted to the Singlecut - and both guitars have coil-splits via a pull switch on the tone controls. Here, unlike the first S2s, the coil-splits are partial: instead of dumping one whole coil, part of it is retained, giving a slighter fuller sound in the split mode - and it's a little more hum-cancelling, too. Plus, with individual tone controls, you can split one or both, and dial in volume and tone changes per pickup. All this makes it potentially the most versatile S2 guitar yet. The bevelled edge flat front certainly gives the S2 a different look - less classic perhaps - and it's thinner in depth at 50mm as opposed to the Core Line Singlecut's more Les Paul-like depth of 58mm. As a result, there's less neck pitch and a slightly different playing feel. Based on the old regular profile, the Pattern Regular neck is a full, though very subtly V'd C shape, with a depth of 22mm at the 1st, and 24mm at the 12th. Fretting is superb, and intonation is spot on, as is tuning stability. The tuners are Korean-made replicas of PRS's Phase II lockers with unplated brass posts, a motif mirrored by the USA-made Stoptail's anodised brass studs; the bridge itself is machined, not cast, aluminium. The S2 #7 humbuckers ape the original USA pickups. "They are very close in build spec," says PRS, "but the #7s, while full and articulate, have a bit more midrange than 245s, which are a bit 'warmer'. They still reflect a 'vintage-inspired' tone." And having extensively gigged a 2001 #7-powered Singlecut, this writer can attest to them nailing a juicy classic-rock sound. Yet, in many ways, the S2 is a different guitar. It's lighter in weight and less girthsome, both in feel and sound. "The new S2 seems to suggest a more contemporary, thrashier single-cut voice"
The older Singlecut sounds woodier and thicker, with a dry, detailed resonance. The new S2 seems to suggest a more contemporary, thrashier single-cut voice. That's no criticism, and with the coil-splits, the S2 goes to different, twangier, places. They sound really good clean, crunchy or dirty, although the different control layout takes a bit of getting used to compared to a Gibson - although it's far from difficult. To our hands, the S2 still feels better than an SE, and sounds bigger, and more versatile. With a probable street price of £1,299, this is one excellent vintage-y rock-centred Singlecut but with quite a wide-ranging sonic palette to draw from. Let's face it, when most of us are looking for a single-cut, twin humbucker, maple/mahogany solidbody, we head to our nearest Gibson dealer. And Gibson has a handy habit of making its lower-end Les Pauls highly attractive, feature-wise. The S2 Singlecut seems a bit staid by comparison, stuck between the rather good SE Singlecuts, at around half the cost, and the posher, more vintage-style Core Line SC 245, which is double the price. However, this is a thoroughly pro working tool that combines some pretty classic single-cut tones with lighter, brighter and edgier partial coil-splits to really expand the sounds you have at your fingertips. It's a stark reminder of why some of us play PRS guitars: not because of the fancy maple tops or bird inlays, but because they are simply superb instruments for the working musician who's more concerned about getting the job done than the quality of the flame. If that's you, this guitar comes highly recommended.